← Acts 6-8 – A New Tradition? Luke’s account of Stephen’s speech and stoning is a climactic scenario leading into the introduction of Saul. It is obvious that Stephen is proclaiming a new found salvation through Jesus and that the temple is no longer of the same use. For now because of Christ’s death, we all are welcomed to come before the Lord without barriers (Mark 15:38; Eph. 2:14-15, 18). His speech points to God’s work outside of the Jewish people. He tells them that they “always resist the Holy Spirit!” (Acts 7:51). From this and other comments, he may be a sign to them that God is working through him and not them. No longer are they the leaders of the work that God did among His people. But, these apostles who are doing many signs and wonders and displaying the power of the Holy Spirit are being persecuted by the Sanhedrin. The story of Stephen here in Acts 6-7 is appropriately placed, for it signifies the transition that is starting to take place among the Jews and Gentiles. 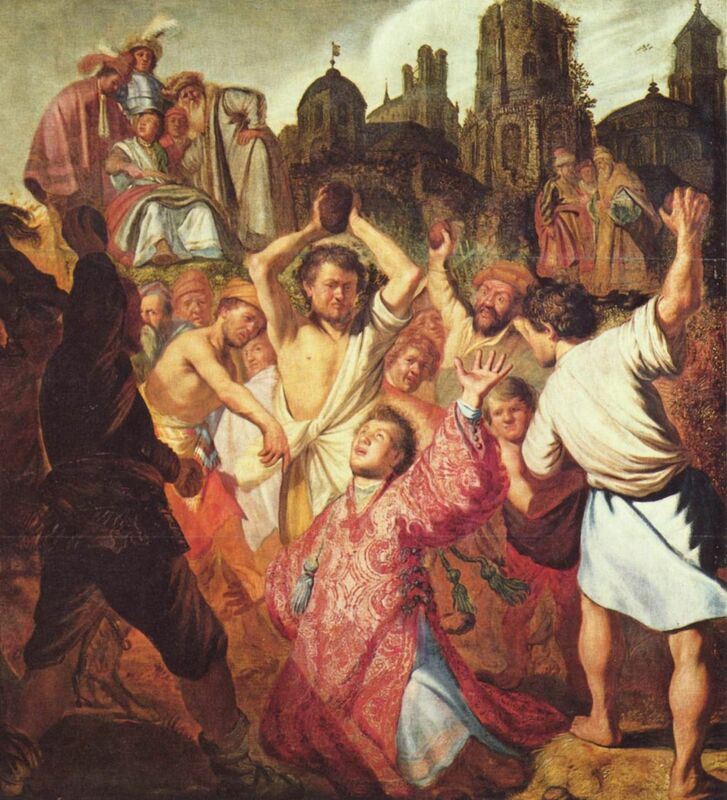 This climactic persecution and death of Stephen is also appropriately placed, for it gives incredible contrast to Saul’s opposition to the church. It only confirms what Stephen said in his speech about these people going against the Messiah and the Holy Spirit. They resisted the Messiah and they resist the work of the Holy Spirit which Stephen may be exemplifying. There are similarities mentioned in this account Luke gives, but could it be that Stephen is somewhat of a symbol of the Holy Spirit’s working, thus truly showing how the Jewish people, not only rejected Jesus as Messiah ending in His death, but they are also are rejecting the Holy Spirit, which is maybe confirmed through Stephen’s death. “But Stephen, full of the Holy Spirit, looked up to heaven and saw the glory of God, and Jesus standing at the right hand of God. 56 ‘Look,’ he said, ‘I see heaven open and the Son of Man standing at the right hand of God’” (Acts 7:55-56). I never really realized it before reading this but the fact that Stephen was the first follower that is executed was killed with parallels to Jesus’ death. I really think that Luke put this is where he did to make the point clear that this man who the Jews killed was the Messiah and that these Jews have turned away and have become resistant to the fact that they killed the Messiah. I would love to be able to take to a few of the jews that were present when Stephen was killed. Not the people that killed him necessarily the people throwing but the few that were standing around or passing by. These people were at the cross when Jesus died so they know what he said while He died and I really want to know if hearing the same words come from Stephen’s mouth cause a moment of doubt in what the others were doing. Did those people who understood that he repeated Jesus and was willing to die for Him have second thoughts about if what he was saying was really a false teaching? I love that Luke put this story right after Peter’s message because it shows the resistance from the different types of Jews to the message that they really did kill the Messiah. Well, I am just going to be blunt here. I am not entirely sure that the placing of this story in this place was such a huge deal. I think that Luke placed it where he did because he wanted to make sure that the reader would have plenty of background on the prior events before just hearing about what happened to Stephen. For example, how could the future reader know why the death of Stephen was significant unless they knew why he was dying? If the reader did not know about Pentecost and the coming of the Holy Spirit, they may not understand why Stephen was willing to defend them to the point of his death. Also, maybe Luke did not think that the reader would know the significant ties between Stephen’s death and Jesus’ death so he felt the need to give a back story. Maybe I’m under-thinking this situation, but maybe not. In terms of Stephen’s accusers, it is interesting that they initially attempted to oppose Stephen publicly and couldn’t withstand his arguments or the Spirit within him. With the many similarities mentioned above between Jesus and Stephen, this actually fits as well (though it is prior to chapter 7 and the trial). Many times the Pharisees, Sadducees, and others tried to argue with Jesus publicly and were always unable to outwit Him or make Him trip on His own words. Similarly, Stephen seems to be preaching emphatically in the area. And just like with Jesus, those who opposed Stephen had to meet secretly to come up with a way to arrest him. When he is finally arrested, the accusation that he stands against Temple and law (and even Moses indirectly) is a broad and vague accusation without any substantial evidence (as pointed out by Luke who says they were “false witnesses” [Acts 6:13]). It seems that Luke places this story at this exact point in the book to show the lack of interest that the Jews have in the Messiah of Jesus. They don’t want to lose the Temple (because it is a physical manifestation of God’s forgiveness of sins), and they don’t want to lose the power that they currently keep as the heads of the Old Testament-like religion (I say this because at this point even the Sanhedrin are adding things to the law and operating under a strict set of rules that were never intended by the Old Testament law). Stephen’s message, though it is unlikely that he directly opposed the Temple as a whole, is a strike at the heart of the current Jewish state of religious affairs. Stephen is accusing the entire Jewish leadership of being corrupt and not following God’s law any longer (Acts 7:51-53). Often in life, we take the least of many matters as a way to strike back at those who have found an inaccuracy in our logic or arguments. It seems to be the same with the Sanhedrin. They have heard a strong argument from Stephen regarding the state of their spiritual standing with God, but they would rather blame him for speaking out against the Temple and not their own actions and hearts. As such, they stone him and kill him. This is a turning point in the book of Acts, because the following chapters show the disciples branching out away from Jerusalem, even to the Gentiles! We like to use the scene of Jesus standing at the right hand of the Father as a final judgment piece against the Jews, but really, the Jews had made the decision on their own before that moment…they don’t want to change because they are comfortable in their own standing, and Stephen threatens their physical and material position as the authority in the Temple and religion. They have rejected Jesus as the Messiah, the Holy Spirit as the direction to point their thoughts, and God the Father as the ultimate source of worth and worship. They are now centered on themselves, and as such, Luke will take the story where the gospel message will go next – Samaria and then to the ends of the earth (Acts 1:8 foreshadowing).